The discovery that humans have only 30,000 genes has been portrayed in some sections of the press as a victory for free will. If we've got fewer genes, if there's less nature, the argument runs, then nurture must take up the slack, right? Perhaps because few of us know what a gene actually does, the debate about whether we are a product of our DNA or our environment rumbles on. The truth is that the two are intimately connected. It's not nature or nurture, it's both, together. In Proverbs, King Solomon had some advice for those rushing into print with ill-informed opinions: "Go to the ant, thou sluggard; consider her ways, and be wise." This is exactly what Edward O. Wilson has done, man and boy, for more than 65 years. He more than anyone understands the relationship between genes and culture and it started with his ants. There are thousands of different species of ant, no one is sure since most of them are unknown to science, and perhaps a hundred million billion of the creatures alive at any one time. True, they haven't written any operas, but they do live in colonies of elegant social complexity. And humanity would disappear from the face of the earth without them. Now 71, Wilson is a tall, slender man, his upper spine crooked from years of looking earthwards. In his brightly lit laboratory behind the Museum of Comparative Zoology at Harvard, he stands over a plastic tray of pheidole rhea, remarkable for having two soldier castes. A few workers are marching up the arms of his linen jacket and across his shoulders. He smiles gently as he eases into a chair, his voice a rich, Southern drawl, even though he left Alabama for Harvard over 45 years ago. His manners are Old South as well - warm, polite and thoughtful. The bleaker inheritance of the South is there too, in a way. Wilson's career has been unusually fruitful. 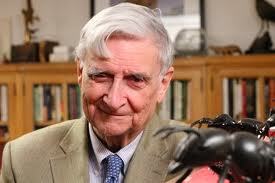 And while he has had a lifelong obsession with ants, discovering how they communicate through pheromones, he is most famous for the publication in 1975 of Sociobiology: The New Synthesis, a work of deep insight that advanced evolutionary thinking and proved a Darwinian manifesto, describing social behaviour from the ants to humans. It also landed Wilson in the fight of his intellectual life. Accused of racism and misogyny, of suggesting that some human beings are genetically superior to others, of echoing Nazi doctrines on eugenics, Wilson and his ideas were splashed on the cover of Time and the front page of the New York Times. Echoes of that fight were faintly heard this week in the renewed nature or nurture debate. It is hard to imagine this generous and polite man at the heart of controversy, let alone one of the most fundamental and bitter scientific arguments of the 20th century. But after it was over, his position in the evolutionary firmament rose to be right up there, on the right hand of Charles Darwin himself. He has won a raft of scientific and conservation prizes, including the National Medal of Science in the US and the prestigious Craaford Prize from the Royal Swedish Academy of Sciences, as well as two Pulitzers, the first for On Human Nature, published in 1978 and reissued by Penguin next month, and the second in 1990 for an uncompromisingly scientific study of ants, written with his collaborator Bert Hslldobler. Fellow scientists acknowledge how profound his contribution has been. Jared Diamond, who has his own Pulitzer for Guns, Germs And Steel, described him as "one of the 20th century's greatest thinkers," while fellow evolutionary biologist Richard Dawkins admires his breadth of understanding: "He is hugely learned, not just in his field of social insects, but in anthropology and other subjects as well. He is an outstanding synthesiser, his knowledge is immense and he manages to bring it all together in a coherent way." The novelist Ian McEwan describes Wilson as "an intellectual hero", and praises the quality of his writing. "Frankly, I do not know of another working scientist whose prose is better than his. He can be witty, scathing and inspirational by turns. He is a superb celebrator of science in all its manifestations, as well as being a scourge of bogus, post-modernist, relativist pseudo-science, and so-called New Age thinking." In recent years, Wilson's other great expertise, conservation biology, has returned to the side of the angels. In the 1950s, before his discoveries about chemical language in ants or his ideas about sociobiology, he was in New Guinea studying biogeography, the geographical spread of species, which has offered evolutionary biologists a rich hunting ground for discoveries about natural selection and the mathematical principles that underpin how environments function. Later, working with the brilliant population biologist Robert MacArthur, this early research formed the basis for another seminal work The Theory Of Island Biogeography. MacArthur, who died in his early 40s from renal cancer, once told Wilson that he would rather save an endangered habitat than formulate a grand scientific theory. Ironically, as the planet's last wild places effectively become islands in a sea of human development, Wilson and MacArthur's theories have become a useful tool in the conservation struggle that will dominate the 21st century. It is this final battle which is exercising Wilson. With the human population expected to reach 9-10bn by the end of the century and the planet in the middle of its sixth mass extinction - this time due to human activity - the next few years are critical in maintaining anything near the current level of biodiversity. His 1992 classic, The Diversity of Life, which defined our obligation to conserve ecosystems, is being reissued by Penguin in April. Wilson's interest focuses on biodiversity hotspots, a term coined by Oxford environmental scientist Norman Myers and referring to 25 areas making up an Alaska-sized 1.4% of the Earth's surface which contain 60% of the world's species. Save these areas, the theory goes, and you save a good chunk of biodiversity. Wilson has added his weight to Conservation International, a hard-hitting, wealthy and relatively young organisation whose board includes Intel's co-founder Gordon Moore, Michael Eisner, chairman of Disney, and the actor Harrison Ford, all of whom, Wilson says, are very knowledgeable. Biodiversity might not ring any bells with British opinion formers, but in the United States it has become one of the burning issues for the nation's billionaires to support. "The situation is so bad that even a small effort in a country like Ghana or Surinam, with what might be considered a modest investment by US standards, can make an enormous difference," Wilson says. He takes particular pleasure in CI's latest triumph, securing the logging rights to a 200,000-acre chunk of rainforest in Guyana. Communications entrepreneur Craig McCaw stumped up the $5m needed and the group has plans to repeat the exercise in Bolivia, Peru and Cambodia. In conservation terms it's a big change in direction. While Wilson makes no apologies for his can-do American approach to saving the planet, he doesn't attempt to defend American consumerism. "We live in a delusional state," he says of the West, finding himself in tune with more radical anti-corporatists and in complete opposition to the new Bush administration. "America in particular imposes an horrendous burden on the world. We have this wonderful standard of living but it comes at enormous cost." He goes onto describe the concept of the ecological footprint, how each American citizen requires 24 acres to sustain his or her lifestyle, while those in developing countries use a tenth of that, and adds: "To bring the world's 6bn people using today's technology up to the level of the average American will require four more Planet Earths. I've seen the figures for this assessment, I've repeated them in front of a wide variety of experts, nobody has refuted it. "It's an enormous differential. The right-wing know-nothings in the conservative think-tanks in Washington, and the demagogues of whom we have an abundance in the US keep coming back: 'Well, that's what America is all about, we want the rest of the world to reach our standard, right?' Wrong! We're running out of land. The two major challenges for the 21st century are to improve the economic situation of the majority and save as much of the planet as we can." Wilson's ideas for solutions will delight and appal green campaigners: "The education of women is the best way to save the environment," he begins, highlighting over-population. He also wants smaller cars, greater water efficiency and more vegetarianism: "75% of the surface area of Los Angeles is given over to the automobile," he says "and reducing the impact of cars is the way to live better." But he also sees a central role for genetically modified organisms. "I'll probably get it in the neck from my conservationist colleagues, but we've got to go all out on genetically modified crops. There doesn't seem to be any other way of creating the next green revolution without GMOs. The last green revolution saved millions from starvation but it did so at immense environmental cost. [The new revolution] has got to work at two levels, using new plants that are outside our current habits, but also by using GMOs. We've got to be able to cultivate dry ranch land with the right crops; we've got to be able to convert wasteland, including the low biodiversity salt flats or areas destroyed by overuse and abandoned." Fate seems to have driven Wilson to being an entomologist. In his frank and compassionate autobiography Naturalist, he remembers his first connection with nature aged seven, at around the time of his parents' divorce. While they fought it out at home, he was sent away to Paradise Beach in Florida. In the fish and other creatures he saw another world he could escape to. His father, in later life an alcoholic who committed suicide rather than face chronic ill-health, moved restlessly from city to city almost every year, working as a government accountant, and he took his son with him. Natural history became the constant in Wilson's life, and each new town his father lived in offered contrasting environments to explore. Short, skinny and by his own admission somewhat geekish, Wilson nevertheless stood his ground in the inevitable confrontation with the neighbourhood bully at each new school, among them the Gulf Coast Military Academy, which he described as "a carefully planned nightmare engineered for the betterment of the untutored and undisciplined". In his autobiography he says that at 13, he was a workaholic with a "monster" paper round, getting up at 3 am to deliver 420 copies of the local newspaper before school. He had friends, often those who shared his love of nature and the freedom of being outdoors, and he was physically brave, but as a child he was always the stranger, never on the inside. He has also said that as a child "the Boy Scouts of America seemed invented just for me". He still "reads with remembered pleasure" his original 1940 Handbook For Boys, bought for half a dollar. "It was packed with useful information on the subjects I liked the most. It stressed outdoor life and natural history: camping, hiking, swimming..." The other defining influence on his eventual specialty was pure accident. While at Paradise Beach, he was fishing for a type of perch off the docks. Striking too hard on a biting fish, it flew from the water and its needle-like spines embedded in the pupil of Wilson's right eye. Eventually the wound required surgery, leaving Wilson traumatised with a phobia of his face being covered - a consequence of the anaesthesia - and full sight in only his left eye, and only then at close range. This disability, coupled with poor hearing, probably inherited, left him ill-equipped for studying birds or frogs, which he couldn't hear or see well. So he opted instead for those creatures that could be observed right under his nose. While he talks freely about his childhood, he is more reticent about his later family life and rarely alludes in interviews to his wife Renee and daughter Cathy. Wilson is fascinated by early memories, not trusting them but still enthralled at the mythologies we build around ourselves; he cannot resist the point where his genetic inheritance meets his own experience as an individual - which includes his childhood religious phase - a point which his research has focused on. After his parents' divorce in Pensacola, Florida, he lived with a family friend, Belle Raub, and came to share her faith, although he preferred his family's Baptist background to "Mother" Raub's Methodism. He describes himself in his most recent work Consilience as having been "laid backward under the water on the arm of a sturdy pastor" and while his atheism was complete before he went to university, he understands the need of what he calls the transcendental experience at the heart of human nature. One of his major contributions has been, with the physicist turned biologist Charles Lumsden, the idea of "gene-culture co-evolution". It is hardly an elegant term, and one that receives a very mixed response, but essentially it describes how culture and genetics intertwine to create the complexity of human life. In essence, he has reached for the biological roots of culture. A straightforward example would be the tolerance of some but not other human societies to the lactose in cow's milk. A subtler example is the mythological status snakes - the serpent of Eden, Ouroboros in Greek myth - hold in most cultures. There is a genetic advantage to avoiding snakes; culture takes that inherent fear and reinforces it through art, spiritual ceremonies or narratives. While still a teenager, Wilson became enthralled by the ideas of the modern synthesis, the combination of Darwinian natural selection and Mendelian genetics, catalysed by Theodosius Dobzhansky's Genetics And The Origin Of Species. Wilson's particular hero was Ernst Mayr, the architect of neo-Darwinism and later a colleague at Harvard. Wilson read Mayr's Systematics and Origin Of Species at 18. "When I saw there was a whole system of science based on genetics, of serious work in the evolutionary pattern, that was an epiphany. Everything I loved and wanted to do in life was in patterns, it made sense, whereas the traditional explanations for everything didn't. It opened the door to me, thinking hard about other aspects like morality and religion, although I didn't do much about that until I reached my 40s." Working with social insects put Wilson at the heart of the next expansion of understanding in evolutionary biology - social behaviour. Until the 1950s, behaviour had been the preserve of social scientists; most biologists didn't see it as part of their field. Wilson was given a post-grad student, Stuart Altmann, who was studying the social behaviour of rhesus macaque monkeys. Together, they discussed common themes in social behaviour, Wilson supplying his experience of ants. The tiny insects had evolved to perform tasks in just the right numbers and with just the right adaptations. You could, Wilson and others discovered, formulate mathematical equations which predicted a wide range of behaviour, right down to what Wilson termed "adaptive demography", altering birth rates to suit the prevailing conditions. Other aspects of ant behaviour could be triggered with the chemical signals that he discovered. By dipping bits of paper in the juice of dead ants, Wilson prompted live ants to carry the paper from their nests, just as they do with the corpses of their sisters. Ant behaviour wasn't learned, it was instinctive. There were other strands in Wilson's synthesis, like new ideas on aggression, but the most important was British evolutionary biologist William Hamilton's explanation of kin selection. Darwin had spotted that ant castes threatened his idea of natural selection; here was a group of animals that apart from the queens didn't reproduce but worked cooperatively for the good of the colony. How to explain such altruism in Darwinian terms of natural selection? Hamilton's answer was that siblings will sacrifice themselves for the propagation of the genes they share. The idea had been suggested before, but Hamilton dressed it in calculus and made it demonstrable. The story of how Wilson read Hamilton's paper on a train journey from Harvard to Florida during which he became converted to Hamilton's view is scientific folklore. Was he disappointed to have missed such a major piece of the evolutionary puzzle? "As a researcher in social insects,I should have seen it," he says. "And it's importance was even greater than I originally thought. But I wasn't really disappointed. By then, I was in the process of synthesising; I wasn't so much concerned about making individual discoveries. What I was doing was working out the chemical language of ants, and that's an important part of sociobiology too." Hamilton is a compelling figure, described by John Maynard Smith as "the only bloody genius we've got", and Wilson, among others, championed his cause. Self-effacing, but at times almost mystical in his approach to biology, Hamilton died last year, apparently of malaria, after going to the Congo to help research Edward Hooper's theories about the origins of Aids. Talking about him, Wilson seems almost bereft. Was he surprised by his death? "Not overly surprised, but I was shocked." Once Wilson would have followed Hamilton into the jungle, now he seems almost angry that his friend is gone. "I didn't understand what he was doing a lot of the time, because he didn't seem to be doing research or getting published. He just loved going to difficult places. I didn't understand what he was doing in the Congo. He could have handled those questions from a remote distance." Like Wilson, Hamilton was also attacked - the anthropologist SL Washburn dismissed his ideas on human sociobiology as "reductionist, racist and ridiculous" - but Wilson was far more visible, publishing three books in the 1970s on the subject, starting with The Insect Societies in 1971. Sociobiology: The New Synthesis, the title echoing Wilson's heroes of the 1930s, was published in 1975. Had it dealt only with animals it would have been accepted as a major work with many important ideas crystallised - in 1989, fellows of the Animal Behaviour Society voted it the most influential book on animal behaviour of all time. But by including a final chapter, 30 pages out of almost 600, on the ultimate social animal, homo sapiens, Wilson was lighting the blue touch-paper. Because while the world was content to allow evolution to explain why and how another species is created and how it might behave, the human mind remained off-limits, the preserve of social scientists and theologians, philosophers and novelists. Anyone, it seemed, but biologists. Old scientific controversies are often unpalatable when reheated, but the furore generated by Sociobiology rumbles on. Nor did Wilson duck the opportunity to flag his theories. "Let us now consider man in the free spirit of natural history," the chapter begins, echoing the Psalms Wilson read as a boy. People are animals, their behaviour has evolved just like that of the animals, and our culture has a biological component, he announced. Human sexuality has evolved in certain ways for specific reasons, all through natural selection. It seemed to some that he was undermining human dignity. Others bristled at an intellectual threat. "Tactically he was unwise," says Richard Dawkins, "because it appeared to sociologists and anthropologists that he was empire-building. It sounded threatening, as though here was a biologist trying to move in on their territory. That caused a lot of ruffled feathers which may not have helped matters." By talking so starkly in terms of the genetic foundation of human behaviour, Wilson offered himself up to more political minds who had much to lose intellectually if his ideas were right. Opposition emerged at several levels, the most conspicuous from radical students who denounced him publicly at his lectures and on campus. At the height of the controversy, at a meeting of the American Association for the Advancement of Science, a debate he joined on sociobiology was interrupted by demonstrators who poured a pitcher of water over his head; psychologically bewildering for a gentle man more used to debate than demonstration. But the real opposition to Wilson's ideas, the attacks that hurt, came from within his own department, from the Marxist biologists Stephen Jay Gould and Richard Lewontin. The two camps crystallised two views of humanity: the first, that our psychology and social behaviour have evolved along with the rest of us and that every facet of human behaviour, even, say, homosexuality, is influenced by our genetic inheritance; and the second, that the human mind somehow escapes natural selection and answers to another, higher epistemology. Gould and Lewontin believed that "the purpose of critical science is to promote socialism, which is the only just form of government", and they saw sociobiology, erroneously as it turns out, as an inherently right-wing, individualistic philosophy. They accused Wilson of sending human nature back to the concentration camps. Wilson isn't a determinist who believes that life is purely mechanistic, and he isn't right-wing - he remains a Democrat and fears the environmental worst from the George Bush presidency. Although Wilson argued that homosexuality might have a genetic element, he also argued that it was therefore natural and should be tolerated. But Gould was good-humoured and discursive, taking an apparently compassionate view of human nature, and Lewontin, a population geneticist who could show that racial differences are genetically tiny, added credence to charges of racism, even though Wilson hadn't brought the subject up. Did he think that his opponents were themselves guilty of prejudice? "They were, although they never admitted it," Wilson says slowly, reaching for the words. "I came from the Old South, I was raised as a racist. I mean, we all were. It was only in my teens that I began to change. But here, if you were called racist - well, in the 70s it was like a death sentence." The wounds from this fight seem fresh even now, probably because, as Dawkins suggests, the assault came from so close to home and without warning: "They did this thing in print without giving him the slightest inkling what was going on," he says. "The first Wilson knew about it was when he saw their really very vicious tirade in the New York Review of Books, and I think he felt keenly the discourtesy of them not popping down the hall to talk to him about it." "That was excruciating," Wilson agrees, but if the argument was wearying, Wilson's intellectual steel glints when he summarises the current position. "I think the sociobiology controversy is essentially over. The contraries are ageing. No young scientists are joining. They are not handing on the torch but passing it around a smaller and smaller circle." He acknowledges one charge as having validity, the accusation from more thoughtful feminists that he had over-simplified the role of women. "As time has gone on two things have happened," he says. "One is that we are vastly better informed about gender differences, their genetic and physiological bases, right down to fine- tuning of hormonal regulation of behaviour. Another thing is that scientists like Sarah Hardy have been able to demonstrate a far greater richness of female flexibility in reproductive strategies. It's far more subtle and sophisticated than we anticipated. The theory in the 70s was that women were more passive, judging between male capacities, but now we know that women are vastly more powerful than that in establishing relationships." With sociobiology prospering, Wilson has carried his research into the full arena of human knowledge, publishing the hugely ambitious Consilience in 1998, in which he developed his ideas about gene-culture co-evolution further and resurrected CP Snow's efforts to conjoin the "two cultures". In fact, Wilson's arguments are more fundamental and persuasive than Snow's; works on evolution, like Sociobiology and Dawkins's The Selfish Gene, have been absorbed into western cultural life as neatly as any neo-Darwinist could have predicted. "He is," says Ian McEwan, "a scientific materialist who warmly embraces the diversity of human achievement - including religion and art, which he sees in evolutionary terms. One of his tasks has been to further the Enlightenment project of absorbing the social sciences into science proper; another has been to find a sound ethical basis for ecological thinking. He is fundamentally a rational optimist who shows us the beauty of the narrative of life on earth. He is living proof that materialism need not be a bleak world view."